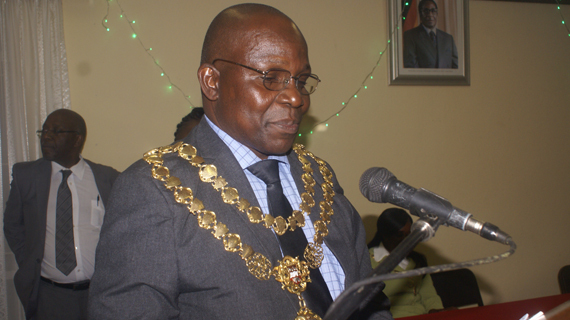 Bulawayo mayor Martin Moyo has given residents a big cheer ahead of the impending national elections by stopping the city fathers from disconnecting water supplies to defaulting consumers. Moyo came into office on the MDC ticket, the country's largest opposition party which will lock horns with the ruling Zanu-PF in the eagerly-awaited polls due at the end of next month. The Bulawayo City Council (BCC) has been clamping down on defaulting residents by disconnecting water supplies as it bid to improve its revenues and reduce the residents and industry's debts. "Our position is that let's not cut water, let's find other means of demanding our payments like giving a final warning. "I was talking to the town clerk and he assured me that they discussed that at management level. "We have an operations team on the ground which might not have received the instructions to that effect. "I think it's an interdepartmental thing where there could have been communication breakdown," Moyo told Southern News as he explained water disconnections in the city. "My position is that we must stop cutting water supplies to residents. The economy hasn't improved so many are still struggling to pay their bills let's not be too harsh," he added. Curiously, the timing of BCC's decision comes as the country hurtles towards the July 30 national polls. In the run up to July 31, 2013 national elections, former Local Government minister Ignatius Chombo, with the approval of former president Robert Mugabe's Cabinet, scrapped residents' water bills running into millions of dollars, in a controversial move which was interpreted as vote buying. Most municipalities have not recovered from the ill-advised decision from which the celebrating consumers profited at the expense of improved service delivery. Meanwhile, the BCC has explained the dry taps and toilets at the White City Stadium which attracted severe criticism from President Emmerson Mnangagwa. Mnangagwa claimed the BCC had deliberately shut out water to sabotage his star rally. "For the past week we have been cleaning Magwegwe reservoir, it then affected water pumping pressure resulting in low lying areas such as Mpopoma, Njube and Entumbane being affected. "Unfortunately the situation was worsened by major pipe bursts that occurred. "The cleaning of the reservoir will be over by end day today (Tuesday) and normal supply will resume. "It was not deliberate as the president wanted people to believe, because in the first place Zanu-PF had not indicated to us that they would be using the stadium on the very day they did, they had told us they were coming this weekend but they changed last minute. "And also it was not fair for the president to say whatever he said about the Bulawayo council because we had to dispatch bowsers to mitigate the situation," Ward 4 councillor Silas Chigora explained.